The Compass Blog, Driven by Waze: Where Are You Going Next? As marketers, we strive to reach the right person at the right time with the right message. As technology improves, so does the ability to (more precisely) achieve this goal. Place has become a critical factor, now that GPS data is widely available. Place, time, and intent all help determine how contextual a message can be—but how do we better understand context for each user? And how do advertisers apply this idea of context to inform their marketing strategy? By using location data, we can look at overall patterns of user behavior and predict when a user is more likely to want a certain product or brand, or to seek a specific destination. To illustrate this concept, we aggregated Waze navigation data (anonymized for user privacy). We used an association approach, which is common in many e-commerce applications, to analyze the data. An association is basically a rule saying "if A happened, then B is much more likely." Amazon's "Customers Who Bought This Item Also Bought" and LinkedIn's "People Also Viewed" are both examples of association analysis. In our research, we used location data from sequences of user navigation data occurring one after the other to try to find association rules between them. Each sequence's analysis focused on specific brands and any locations that users may have been more likely to navigate to, either before or after visiting that brand's store location. Each comparison shows two sets of navigation probabilities. 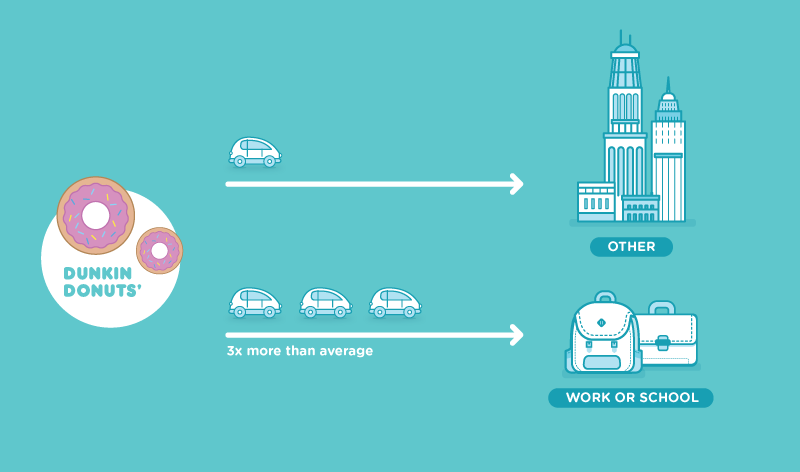 One is the "sequential drive"—looking at the likelihood that users who visited place A would go to place B directly after. The sequential drive is then compared to all users who visited only place B within the same time period. The difference between these two percentages is called a "lift." If the lift is significant, meaning the drives are more likely to happen in sequence than on their own, we can call this a trend. Here are the results from one week of US location data. In the morning, we found that users who went to Dunkin' Donuts were more than three times as likely than average to go to a place defined as a school or a workplace, suggesting that people like to make a stop here as part of their morning routine. Not surprisingly, users who go to Starbucks in the morning are three to four times more likely than average to go to an "office space," school, or college immediately after. 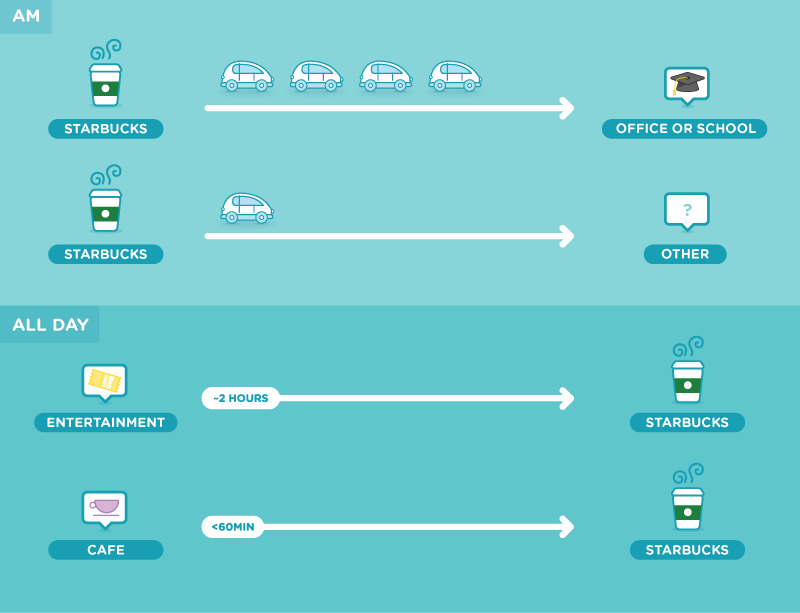 However, when looking at the whole day, we found that people who go to Starbucks are also more likely to go to another coffee shop less than one hour before, and that they tend to go to a "culture and entertainment" location around two hours beforehand. This trend could imply that people see Starbucks as venue for social and business engagements, as opposed to a quick stop-off. It seems that In-N-Out Burger might not just be for Californians. 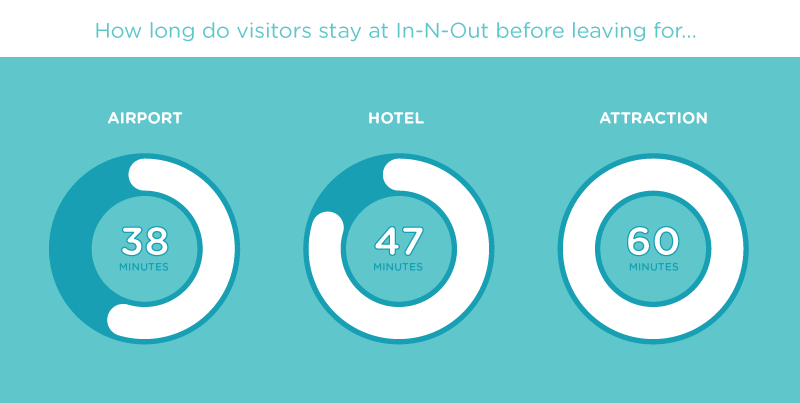 From our data, many users who go to In-N-Out-Burger are much more likely (1.5 times to twice as much) to go to a hotel, airport, or tourist attraction right after. In addition, when looking at how much time they spent at In-N-Out, we see that those going to an attraction take their time and stay over an hour, those on their way to a hotel spend around 47 minutes, and those who have to go to the airport are in a hurry and leave after 38 minutes. There are some interesting correlations related to consumer shopping behavior when looking at major retail chain Target, particularly when it comes to the order of shopping stops. Users who go to Target are much more likely to go to Party City right after, and vice versa. One interesting distinction—people stay at Target for one hour, but will leave Party City after less than 38 minutes. 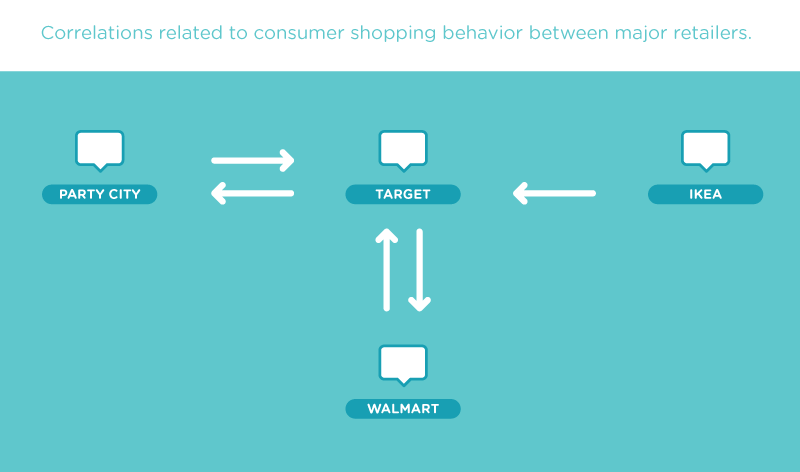 We also saw a very high correlation between users who go to Walmart and Target during the same trip—users are six times more likely to go to both than to either on its own. People stay at Target for roughly eight minutes less than they do at Walmart. Users who go to IKEA are also very likely to go to Target, but there is no significant lift the other way. Is it possible that people who shop at IKEA for home furniture go afterwards to Target for complementary cheaper buys? In addition, users are in IKEA for an average of almost 90 minutes, the longest stay of any chain. Users who go to Costco are much more likely to go to a supermarket right after their stay at Costco, if it's over an hour. Have they forgotten to buy something and needed additional items closer to home? People who go to Chipotle Mexican Grill are 80 percent more likely to go to a gym/fitness center before they go there. The time they spend in between destinations is averaged at just over 90 minutes, which is enough time to have a workout, shower, and get hungry. Using location data in space and time to measure user intent is a very good way to understand a brand's true customers. We can learn that a brand is being approached by students or parents, or that a burger chain is being approached by a lot of tourists, or the context in which people like to arrive at a certain brand, or which brands fight over the attention of the same people. By analyzing all this data, a brand can try to better understand their audience and adapt a message accordingly, all while serving it at the right time and in the right place. This is the essence of location-based marketing. *All data collected was of an anonymized data set with each bucket of sufficient statistical size to allow meaningful results and respect users' privacy.